One of the biggest problems with starting a book on the Kindle is the “how bloody big is this thing?” question. I think a great invention would be something that changes the weight of the Kindle based on the story you are reading. 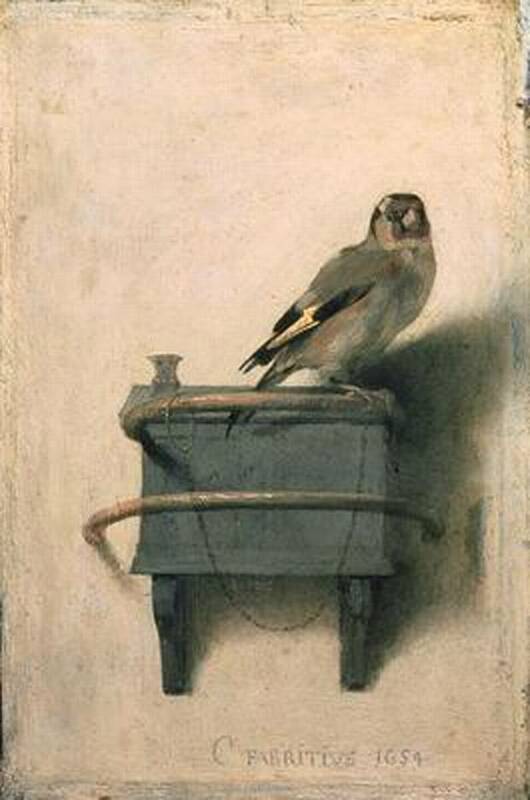 However if that was possible then I’d have probably never started The Goldfinch by Donna Tartt as it comes in at a hefty 800 pages. Set mainly in New York it centres around a boy who loses his mother in a terrorist attack in a museum and finds himself leaving the scene with an incredible, priceless painting. As the years go on and his simultaneous guilt and love of the painting grow, the author does a really good job of not giving you a clue how the story will end. As per normal I don’t want to ruin the story by talking too much about it, but it’s a great combination of theft, guilt, coming of age, loss, redemption and some pretty intense drug taking set in contemporary New York, Las Vegas and Amsterdam. I particularly liked the intense relationship between the protagonist Theo Decker and his friend Boris, even though it was pushed to extremes at times. Even ignoring the great story, one of my favourite parts of the book (not a plot spoiler) was the details about antique restoration, yes I know that sounds like a completely boring subject, but trust me it’s very interesting. And just as music is the space between notes, just as the stars are beautiful because of the space between them, just as the sun strikes raindrops at a certain angle and throws a prism of color across the sky – so the space where I exist, and want to keep existing, and to be quite frank I hope I die in, is exactly this middle distance: where despair struck pure otherness and created something sublime. 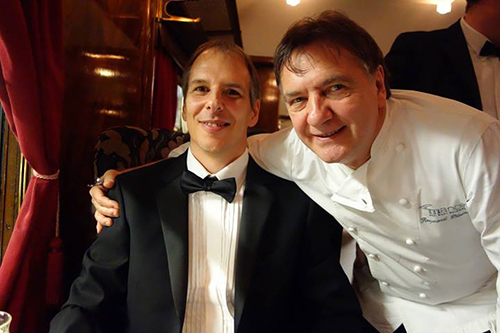 Most amazing evening ever… check in to The Ritz for the night, then get taken for dinner on the Orient Express with Raymond Blanc as the chef! Also read the second book in the Oryx and Crake trilogy by Margaret Atwood and just wasn’t impressed. The Year of the Flood is the story of when mankind is wiped out by a super virus that floods over the planet but the characters were just… bleagh. 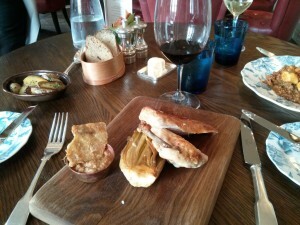 I’ve been to Lime Wood Hotel for dinner twice now and it’s been spectacular both times. Set in the cute shaggy pony infested New Forest, Limewood is beautiful hotel and spa set in lovely grounds. 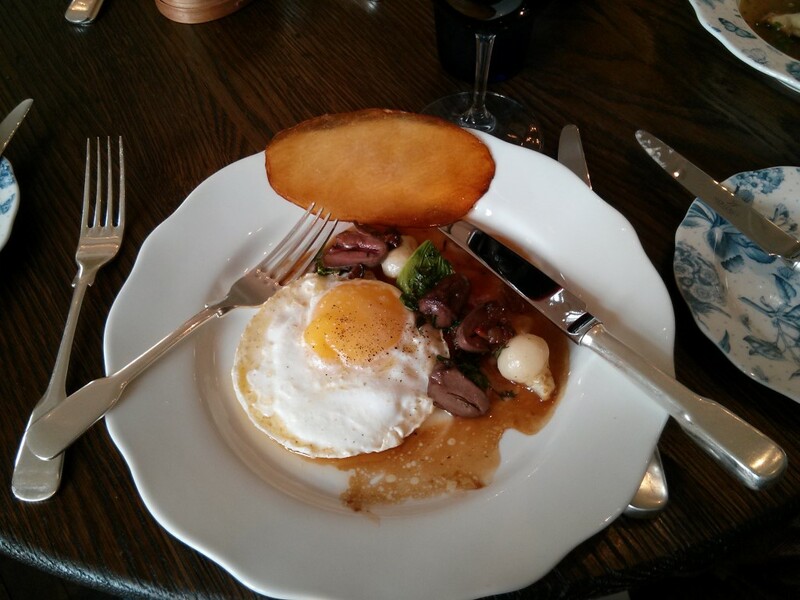 On my first visit I was overjoyed and dismayed to choose the duck hearts to start. Overjoyed because they tasted lovely and I was glad I’d been brave, but dismayed because I WAS EATING THE HEARTS OF THREE DUCKIES! And even worse, they looked like cute little hearts in my dish. Just recently I returned to Limewood for Sunday lunch and it was even better. I had the roast chicken and it had the most perfect texture and consistency. The staff were incredibly friendly, even to the extent of us asking for a yorkshire pudding and they brought out a huge bowl stuffed with them. It’s not the cheapest place by far, but if you like decent food and a lovely informal service in a beautiful setting then you can’t go wrong. 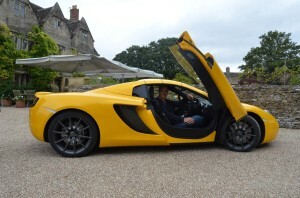 So, thanks to another “well deserved” gift, I recently had the opportunity to drive six supercars around the Cotswold countryside. The event was with DreamCarHire and to be honest before the day arrived I was expecting it to involve driving along in a procession at around 40mph whilst being watched like a hawk. How wrong I was! We arrived in a small village to be greated with a beautiful sight (the bacon sandwiches, there were also some cars outside). 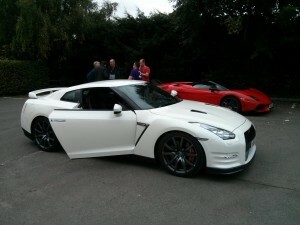 After a very well done safety briefing (“It’s your licence at risk”) we were taken outside to meet the first car of the morning a rather studly Nissan GTR. “Oh, a Nissan” I hear you say. Yes, a Nissan that can do 0-60 in 2.8 seconds! In what seemed like about 2 minutes, Jen and I were on the road, with a map and a destination to aim for and no-one around us at all. So, I screamed and floored it of course! Now, it’s about 10am at this point and I’m already spoiled. I started complaining! I found the ride quite crashy, it didn’t make an amazing sound, it felt quick but not rocket ship quick. I had to take a second to realise I’d been given the keys to a damned amazing car and ought to slap some sense into myself quickly! Next up I have to hang my head in shame, the company had specifically brought my dream car over from Europe, just for me, as they knew how much I wanted to drive it…. and I am sorry to say that of the 6 cars I drove that day it was my 3rd or 4th favourite! 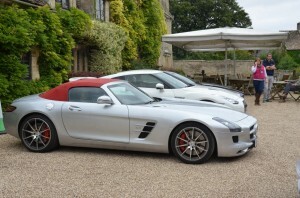 It was, of course, the beautiful Mercedes SLS AMG. In its favour it made the most amazing noise, akin to a WWII bomber flying on just one engine, but it was too typically Mercedes inside, the interior really didn’t stand out considering we’re talking £165,000 worth of car. 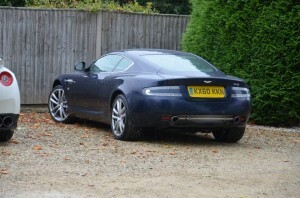 I did love driving it, but, for shame, in the words of Lily Allen it just didn’t make me scream. We had a lovely lunch and a good natter about cars (I forgot to mention there were 12 guests and 6 cars, so we just swapped cars throughout the day) and then it was, I’m almost incapable of believing, into a Mclaren MP4-12C. A car I never dreamed I’d drive. It was unbloodybelievable. I felt like I’d been transported to the 23rd century and was just speechless as I drove this car in a “spirited” manner down the country roads. I even found out that it had a huge air brake that comes up if you break in a “spirited” manner as well. The interior was beautiful, the scissors doors were amazing, but the thing we both remember was the noise. It was like a T-Rex eating Godzilla whilst King Kong was trying to bugger it. Don’t try to picture that by the way. Do I look just slightly happy in that photo? Yeh, I’d say just slightly. Now, the Ferrari wasn’t the one we were supposed to have. 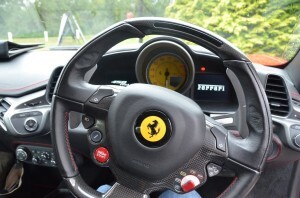 DreamSuperCars had used a competitors car as theirs had issues… and it’s safe to say that this 458 had seen better days. Like, at around XXXmph the vibration was so bad my eyes spontaneously exploded. Also, when I say XXXmph I mean 50mph as I didn’t drive at XXXmph. It did make a fantastic wailing noise when poked though and did look the absolute business. The final car of the day now arrived… Now if someone had told me a month before that I was going to get to drive an Aston Martin DB9 I would have yelped with excitement. However it was poo. Poo Pooo Pooooo. Because clearly by now I was totally spoilt by proper supercars and this mere £130,000 so-called-car was just not in the same league. Also it had some tracking issues that didn’t really inspire confidence! I’m glad I drove this car when I did though as it had started to rain and if I’d been in the Mclaren then they’d still be using a spade to pick bits of me up off the countryside! The final highlight of the day arrived… we’d managed to wangle a private tour of the Williams F1 collection! 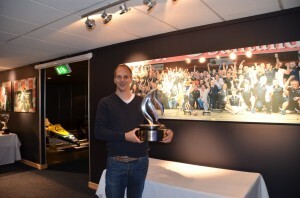 And the awesome car hire staff said the words I was dreaming of… “What car would you like to drive to the Williams HQ”. Woohoo, I’m gonna get back in the 4WD Lambo. Then to my eternal shame, even though I had 4WD and 570bhp I struggled to keep up with the guy I was following… and he was in a Ford Focus! We had a brilliant tour of the collection and trophy room and I finally got back to the hotel with a smile that will never, ever, be wiped off my face. What a day! )-: Ever since learning of the impending loss of my favourite author I’ve been re-reading all of his novels… and to my great delight I realised that I’d not yet read his latest, Stonemouth. 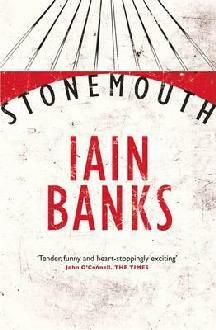 It is a soooo typical Iain Banks book, ticking all of the usual boxes “coming of age story”, “set in Scotland”, “lots of flashbacks”, “redemption and forgiveness” and I absolutely loved it. So much so that I read it in a single sitting, finishing at 2:45am. It’s fundamentally a story about all of us who grow up, fall in love, screw up and want to get forgiveness we don’t deserve. Stewart Gilmour had everything, great friends, beautiful girlfriend, the world at his feet… and threw it all away. That sounds like a typical tabloid story but what is different is that he grew up in a Scottish town run by two mafia/gangster style families and his love interest was the daughter of one of the family heads… bannished from the town for years he finally gets permission to return for a funeral and through a series of flashbacks we learn how he managed to get everything so wrong as he tries to put things right with the girl who he thinks he doesn’t really deserve. The story is relatively run of the mill, with great friends, brilliantly believably dialogue and a tense build up to a typical Bank’s finale. But one thing I loved so much was that there was a “way out” for the protaganist, an almost too easy excuse for his misdemeanours that he’s slowly piecing together through the plot… but in the end Banks decides not to use this get out of jail card and just let the characters find their own way forward. To me this was a brillian piece of plotting, to build up and up a critical part of the story and just let it fade out. Wow. I’m going to really miss Iain Banks and his stories and I hope his last months are as pain free as possible. I never, ever, replay games. I’m currently on my third replay of the new Lara Croft reboot. It may not be my last. It’s a truly spectacular game. 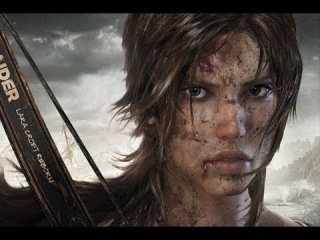 Yes, yesss I know you think I’m saying this because it has Lara Croft in it and she shivers and whimpers and is covered in mud and needs me to help her shower, but really… the game itself, from the weapons to the graphics to the storyline, the voice acting and the emotional involvement is pitch perfect. The story is set at the point when Lara discovers who she really is and becomes the Tomb Raider of the titles. I reckon she’s… hmm.. 22? She starts out naive and romantic but within about 15 minutes she’s shooting deer in the eyeballs and stabbing rabbits just to get the experience so I think it’s safe to say she’s a quick learner. The game really doesn’t shy away from painful moments and I have to look away now when I accidentally impale her through the throat (wait, stop that right now). The story is mature as well, the only weak point is the stereotypical sidekicks including “angry black girl”, “nerd who wants to be cool” etc. By the end of the game she’s tough, scarred and as about as far away from Angeline Jolie as you could ever hope to be. I cannot wait for the follow-on games! I’m not sure it needs the “Arms” in the title, what do you think? Anyway, I had dinner at this beautiful West Sussex pub, just north of Midhurst, last week and it was sublime. 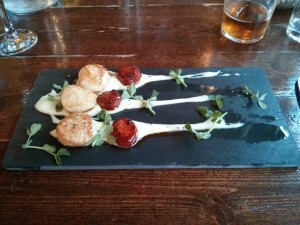 I started with the pan seared scallops with chorizo (what an awesome combination) which were really beautifully cooked. For my main I couldn’t resist the eight-hour braised lamb shank (proud to be serving English lamb as well). It was absolutely huge and beautifully cooked in a sea of mint gravy. To be honest the lamb was so huge that I was replete (i.e. a big fat porker) even though I still wanted a pudding. I went for the chocolate fondant with chocolate bits and chocolate ice cream and more chocolate. It was a little… dull, but maybe that was because I was full. The pub itself is gorgeous and welcomes drinkers as well as foodies, amazing views of the countryside are all around and I really want to go back here for Sunday lunch – even though this is currently booked for around 6 weeks into the future! Apparently they serve a tray of pork/beef or lamb for 4 people and you take home what you don’t eat. I reckon I can manage that all by myself (-: Prices were very reasonable and if it wasn’t so far away from me I’d be here once a week!